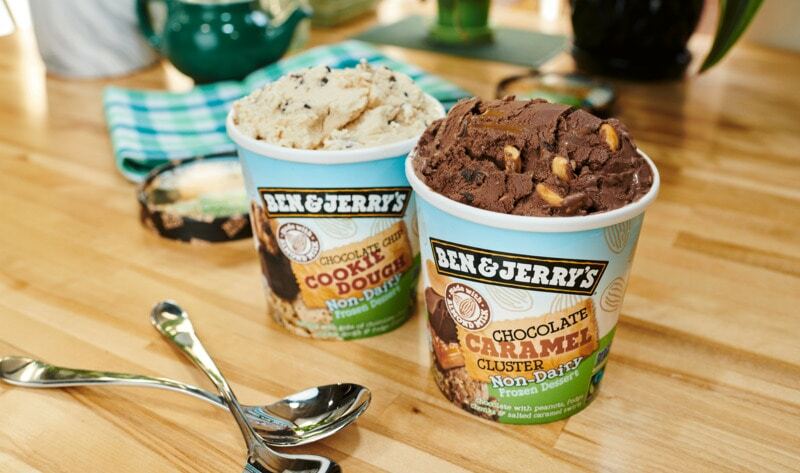 Ben & Jerry’s has added yet more flavours to its range in the form of Non-Dairy Chocolate Chip Cookie Dough and Chocolate Caramel Cluster. Ben & Jerry’s first debuted its vegan-friendly range of in 2016 with four mouth-watering flavours; PB & Cookies, Coffee Caramel Fudge, Chunky Monkey, and Chocolate Fudge Brownie. In 2017, the ice cream brand added three more flavours to its non-dairy range (which now makes 25 percent of their total product line-up), including Cherry Garcia, Coconut Seven Layer Bar, and Caramel Almond Brittle. Now the company has added yet more flavours to its range in the US in the form of Non-Dairy Chocolate Chip Cookie Dough and Chocolate Caramel Cluster. The launch of a vegan-friendly Chocolate Chip Cookie Dough flavour will be welcome news to fans of the company’s popular dairy-based version. The dairy-free offering is made with a dairy-free almond milk-based vanilla ice cream. Like the brand’s classic version of the flavour, this one is packed with a generous helping of chocolate chip cookie dough and chocolate pieces. The second new flavour is Chocolate Caramel Cluster which features a dairy-free almond milk-based chocolate ice-cream loaded with peanuts, fudge chunks, and swirls of salted caramel. Sadly the new flavours are currently only available to purchase in the US, but the company is gradually rolling out its vegan flavours to international markets so expect to see them heading to European freezers in the near future. The UK can currently enjoy four non-dairy Ben & Jerry’s flavours – the newly released Coconutterly Caramel’d, Chunky Monkey, Chocolate Fudge Brownie and Peanut & Butter Cookies. Both new non-dairy Ben & Jerry’s flavours are now available in grocery stores nationwide throughout the US and will retail from $4.48 to $5.99.